On this episode of the ProfitWell Report, Jeff Fagnan, Founder at Accomplice VC, asks us how venture funding can affect core unit economics. To answer Jeff’s question we looked at the data from 3.7 thousand companies within the subscription space specifically. Here’s what we found. Jeff, you’re asking me a question that’s absolutely going to get me into trouble as both a VC apologist and a bootstrapped founder, because as we all should know funding is a tool. It’s not bad or good, but just like if you are using a sledgehammer when a scalpel is required, you can use the tool incorrectly. Let’s start with arguably one of the most important metrics in a subscription business - churn. 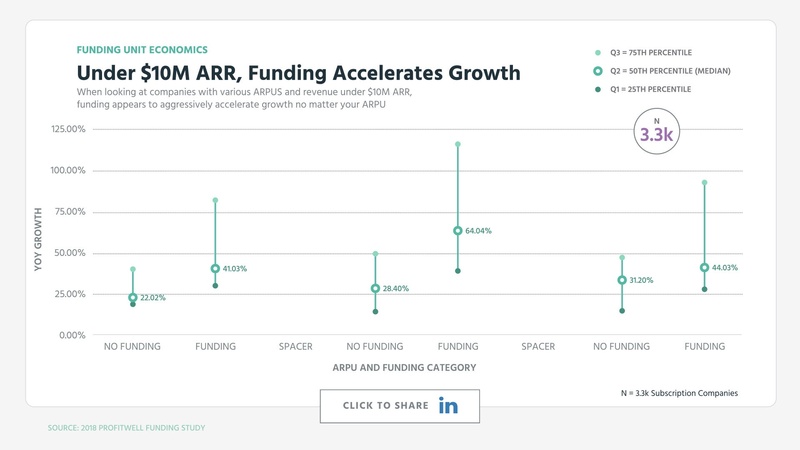 When comparing companies who took on funding to those who haven’t, you’ll note that at most stages of the growth lifecycle funded companies have higher churn with an average of 20 to 30% higher monthly gross revenue churn compared to their non-funded counterparts. There are certainly plenty of lurking variables here, but non-funded companies likely have a bit of survivor bias baked into these numbers simply because they don’t have funding to float them through higher experimentation that is likely taking place amongst funded companies. At least that’s the most charitable interpretation of this data, as there are certainly funded companies that just use the money as a crutch instead of figuring out how to make sure they sell the right product to the right customer and keep that customer around. When comparing customer acquisition cost data amongst these groups both interpretations are supported. 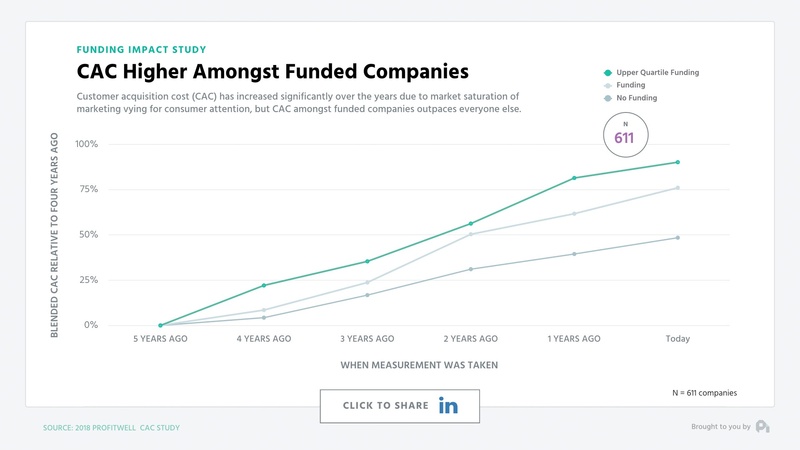 CAC is going up for everyone, but amongst funded companies we’re seeing 50 to 75% higher CAC than non-funded companies. Funded companies likely haphazardly or more targetedly use a good amount of their funding to pursue high cost channels or just more channels in general. We’re essentially seeing different strategies along an axis of conservatism and risk. 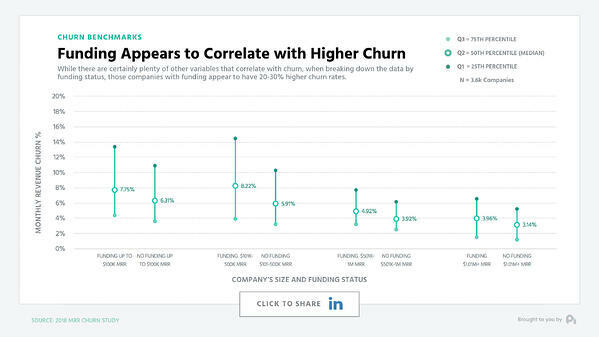 That being said, CAC and Churn obviously matter, but a common argument is that those two metrics can be optimized later - it’s all about growth. Yet, the data is mixed on whether that notion is true or not. When we look at companies under $10M ARR it certainly is true. Funded companies handedly are growing faster than non-funded companies. There’s no question. No matter the ARPU funded companies are growing at a rate of 40 to 100% more per year than non-funded companies with massive variance where some companies are growing at 5x that of their funded counterparts. A counter view to this though is that there’s a massive amount of indie and lifestyle businesses that are under the $10M ARR threshold that just never want to be that large. While not directly supporting this thesis, these gains from funding once we go over $10M in ARR seems to dissipate quite considerably. 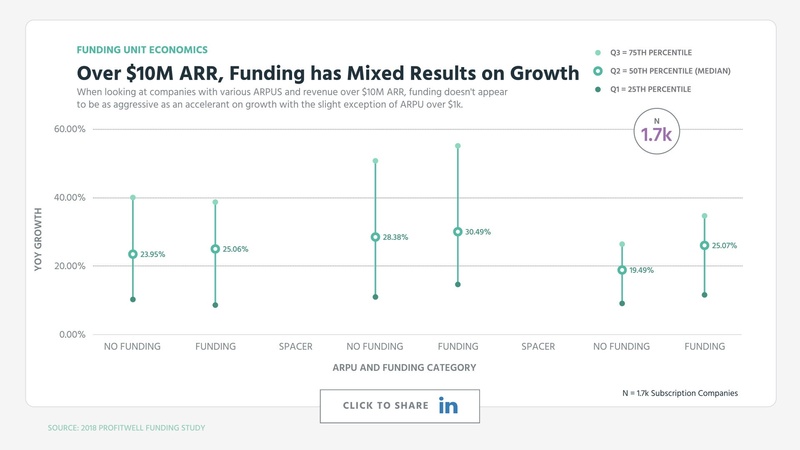 With the slight exception of four figure or more MRR businesses, funded and non-funded companies with more than $10M ARR are essentially growing at the same rate, even when taking the entire midspread of the data into consideration. So where does this put us as an industry? Well, in a sense we’re right back where we started with funding being a tool that when used properly can greatly increase your odds of reaching $10M or more. Yet, some of the differences amongst the core unit economics, as well as how similar companies are when you reach the greater than $10M range suggest that in more cases than the industry is probably willing to admit, funding can create moral hazard and not always in the “let’s make sure we’re comfortable taking the right risk” way. Instead, funding masks core problems that simply get bigger as the company gets bigger, in essence letting you use a sledgehammer when you really should be using a scalpel. Well, that's all for now. If you have a question, ship me an email or video to pc@profitwell.com and let's also thank Jeff for sparking this research by clicking the link below to share and give him a shoutout. We’ll see you next week.